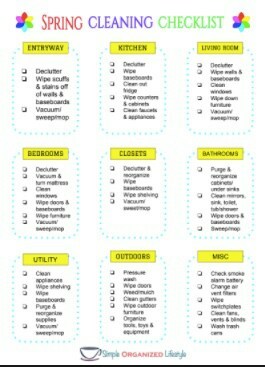 Recently I sent my “top tips” monthly newsletter subscribers a spring cleaning checklist for the whole house printable. I’ve been looking at that checklist and thinking, “how can I tackle each area in the least amount of time?” I’m always looking for tricks to keep a clean home with less effort because what I really want to be doing this spring is spending time outdoors with my family! Maybe you feel the same way- it will be great once it’s done, but less time would be even better! However, I know there are parts of our home that have been neglected through the year and spring is a great time to open the windows, let some fresh air in, and give our home some extra TLC! Below I’m going to go through all of the tasks listed on the printable (it’s in the resource library if you would like a copy) with the hacks to get it done in less time! Gather all of your cleaning supplies in one place ahead of time in a basket or caddy to easily move them from room to room. Make a multi-purpose spray of 1/2 vinegar + 1/2 water + 1 tsp Dawn dish detergent for a simple solution to clean most surfaces. Dress comfortable and consider the exercise an added benefit! Microfiber & multi-purpose cleaning cloths – these are great for different surfaces and economical too! Here’s a little tough love decluttering advice, written straight from lessons learned. Don’t start decluttering the cabinets, closets, or toys…yet! You can do that throughout the year, one space at a time, to keep it from being so overwhelming. When you are spring cleaning, declutter the main areas of the home. For example, we have a shelf in our living room with children’s books for one of our portable book nook areas. Our son hasn’t touched many of those books in a long time and has outgrown several of them. It’s a main traffic area of our home and a great place to declutter for instant improvement. That’s an area I’ll tackle during spring break instead of my bedroom closet, which I will save for another time. Please check out my post on decluttering: what to sell, donate, toss and recycle for all kinds of ideas when it comes to decluttering. After a major decluttering, feel free to use my yard sale organization checklist as a guide for getting rid of the clutter … and make some extra money too! 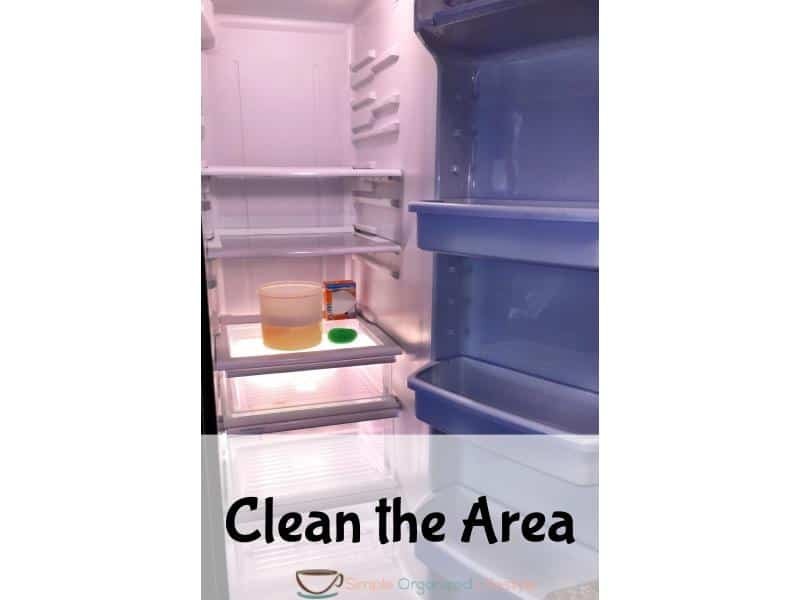 Here’s a post of my fridge cleaning and organizing process, with pictures, from start to finish. The whole process takes about an hour. Use your vacuum attachment to do most of the hard work on baseboards. Use a dryer sheet for any places on the baseboards that still look dusty. Finish by removing any spots or scuffs with a Magic Eraser. Walls can be tricky. Our walls look pretty rough after a young kid and dog but, unfortunately, we used the wrong kind of paint years ago. It comes off with anything more than a wipe with a damp cloth. We need to repaint but are waiting on the kid to get a little older and the dog to get a little calmer. In the mean time, I’ve found using a soft damp cloth works for some of the scuffs without damaging the paint. On one spot that was a particular eyesore, I used a Magic eraser. I’ve also read that toothpaste (paste, not gel) can work on problem areas. Yes, you can call it a hack or cheating… but we adjusted our budget last year and saved up for a robotic vacuum . Oh, happy day! We have mostly hardwood with rugs in our main areas. It saves a ton of time and does a better job than me, and even goes back to the docking station automatically when it finishes a cycle . I highly recommend setting a savings goal and considering one of these appliances to cut down on your time spent keeping the floors vacuumed. Mopping- my least favorite cleaning chore of them all. I don’t know a hack to avoid it, but I will say it’s more tolerable with my wireless headset and a few favorite podcasts or music! Keep it simple and use an extendable swiffer duster . Fill your sink with warm, soapy water and just give everything a quick wipe down. If you come across things in your way on the counters, put them in one place but don’t carry them to different room…yet. That’s an easy way to get sidetracked. 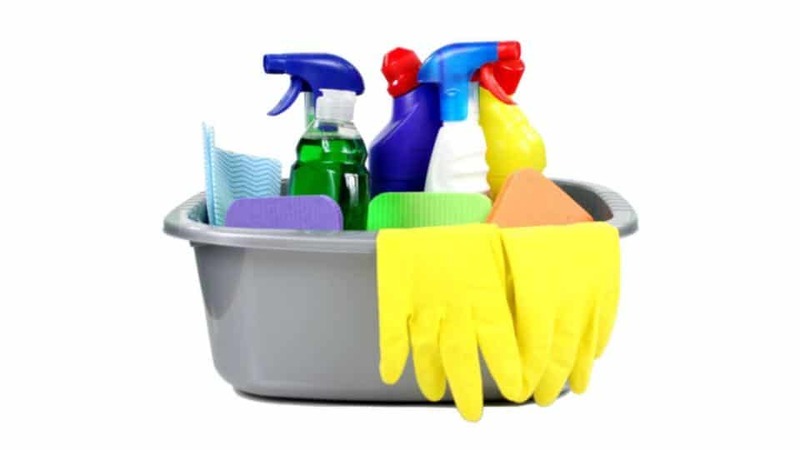 If you work counter clockwise and wipe everything as you go, you will clean faster and cover all of the surfaces. Polish faucets with a dryer sheet, sounds strange, but it works! Put a lemon peel and water in the microwave for 1-2 minutes and wipe it down for a steam cleaning that also leaves a fresh scent. Clean your dishwasher with just vinegar and a hot rinse cycle. Check your oven to see if it has a self-cleaning feature and wipe the top with your multi-purpose cleaning solution. My stove is a glass top and I’ve found that turning one of the back burners on warm for a few minutes, then turning it off and using a wet sponge with a little dawn dish detergent works best. I use my multipurpose spray solution, but I also sprinkle a little baking soda to the sinks and tub/shower too. You could also use a microfiber cloth on your swiffer in the tub and shower to cover more area in less time. I haven’t tried this yet, but the next time I’m in the dollar store, I am going to pick up some denture cleaning tablets. The hack I read was to toss these in the toilet and let them sit overnight to clean the toilet. Totally going to try it out! This is on Mr. SimpOL’s list. He loves it. If he didn’t, then this is a job we would include in the budget for home maintenance that we would pay someone to do. This is on-going throughout spring and summer. One thing that has helped us a lot has been using landscape fabric. We got several pieces free as scraps from a local manufacturing company. It has been a great barrier against weeds. Spray everything down with your vinegar + water solution. Use a soft brush to speed up the time to give everything a wipe down. 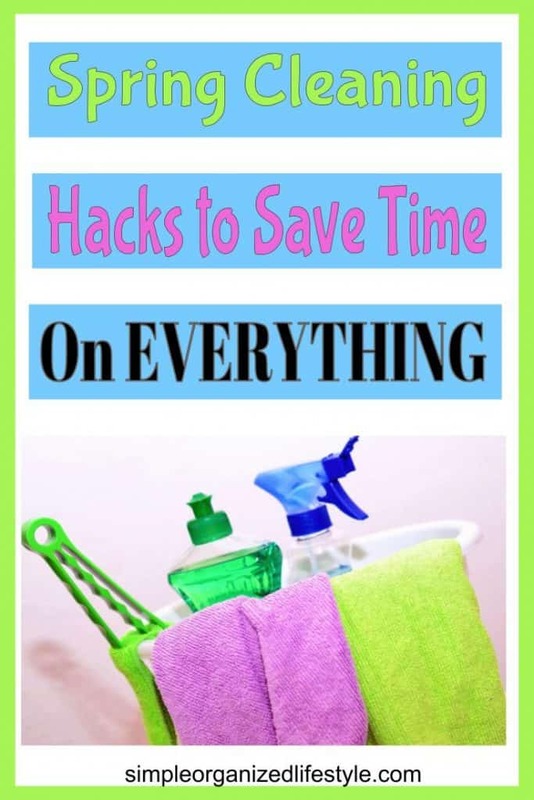 I would love to hear about any clever spring cleaning hacks that you have found to save time! Please share in the comments! Helpful Ideas! I so want to save for a robotic vaccum! We have hard wood floors, an older house and pets! And it adds up to a lot of dust. Glad to hear the vaccums are worth it. Thanks for the dryer sheet and denture cleaner tablet hacks. I’ll be using those! Yes, the robotic vacuum is worth it! Glad you found some new tips to try out, thanks for reading!